I'm so excited to show this polish! This brand has been on my wishlist for so long and I finally own it! 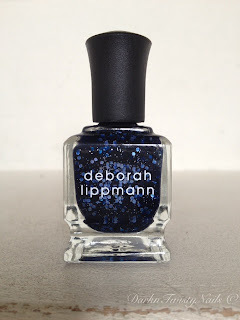 To understand my total excitement about this brand being available in stores over here, you'll have to know I have been lusting after a few Deborah Lippmann polishes for quit some time, but I couldn't justify paying the substantial pricetag these polishes come with and adding the shipping fee to on top of that. I can't tell you how often I placed a couple of them in my shopping cart, only to delete them again because they would double in price due to shipping. This past Saturday, I had a great afternoon of shopping with my friend Kelly. We indulged in a footlong sub at Subway and a cookie (Who goes to get a sandwich at Subway and doesn't eat a cookie???) and went on a hunt for Chanel Taboo for her, because she loves it almost as much as I do. I really wanted to buy Chanel Malice and was getting a little upset I couldn't find it anywhere. I think it was a Limited Edition and has since been taking out of stores. Hoping we would find both, we decided to visit a big department store. They usually have a great cosmetics corner, with a good selection of high end brands. When we walked in and I saw this display, I litterally squealed like the girl that I am! 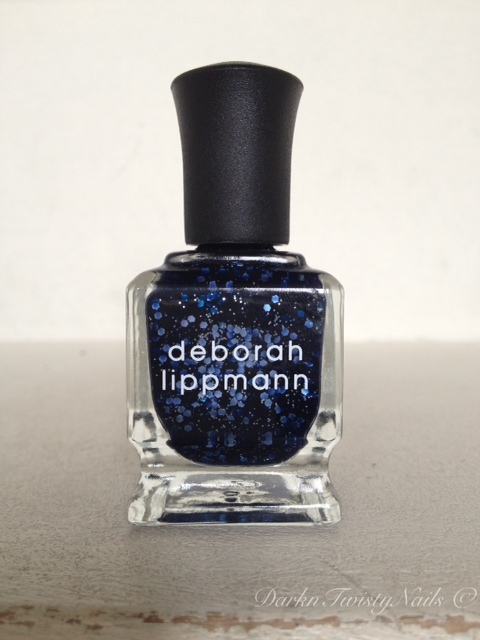 THEY NOW HAVE DEBORAH LIPPMANN POLISHES!!!! The woman behind the register looked at me like I was crazy, but I didn't care! I rushed over to examine every single one of them. I mean, can you blame me? Look at them!!! 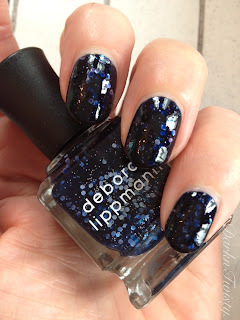 Suffice to say, we totally skipped the Chanel and went straight for Deborah Lippmann. I really couldn't afford buying more polish, but because I've been wanting, no needing, one of those beauties for so long, I gave myself permission to buy one. So, of course, I took two gorgeous polishes home, lol. And boy, am I glad I did! 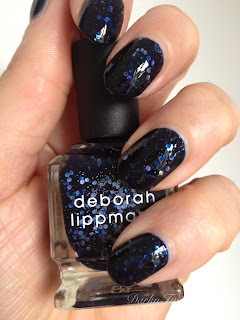 Deborah Lippmann Lady sings the Blues is absolutely stunning and well worth the money! It's a dark, navy blue base with a ton of hexagon and micro silver glitter. The formula is... well... the best I've ever tried when it comes to a glitter polish. 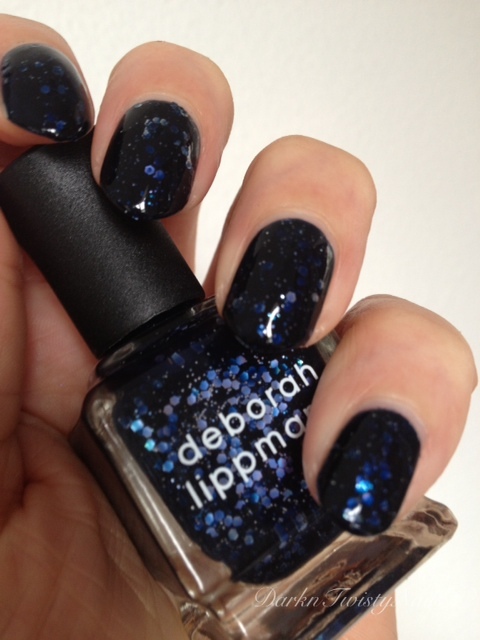 Perfect consistency, flows on the nail, no glitter problems and opaque in just 2 thin coats. To top this all of, it dries really fast! I just can't say enough good things about this polish! Do you own any Deborah Lippmann polishes and which ones are a definite must have? Wow! This one's awesome! Where do you get it and what did it cost? And could you maybe write a blog about how to put your nailpolish on so perfectly? I always struggle with it and wonder how you do it when I read your blogposts. Oh, you definitely need this color! It's well worth the hefty pricetag. Sometimes you just deserve a little present and these polishes are just the right thing to treat yourself!